Growing up I was terrified of the ocean. My parents had a painting in our living room titled “The Sea” and as a little kid I remember sitting backwards on the couch just staring at it, imagining all of the sea monsters that lurked beneath the dark stormy waves. We also used to visit Cape Cod and my hyper-protective Mom would warn me of the dangers of the “undertow”. Oooh, that sounded sooo scary. In my tweens I developed a fascination for all things pirate. I had a black-light poster (I know, I’m dating myself) called “Ghost Ship” that I would stare at for hours at night in the ultraviolet glow while my imagination spun tales of treasure and treachery. 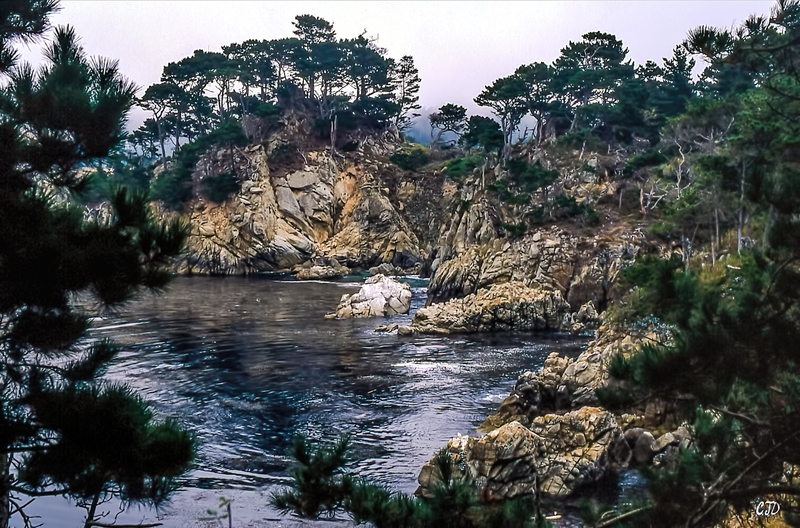 Then in my early 20’s I hiked the cliffs at Point Lobos State Park in Carmel. I looked down through the depths into the dark turquoise abyss and saw anemones and starfish twinkle back. Diving Murre were flying underwater looking for unwary fish to eat. I spoke a promise out loud: “I will learn to dive and come back here”. I was no longer content to look down to study these creatures from my air born world. I wanted to experience their aquatic world from their perspective. Less than a year later I did just that. I got my SCUBA card and did my first certified open water dive at the very spot I made the promise. I was humbled to be swimming with these incredible creatures on their level, in their world. It would forever change me. That day a marine biologist was born. The kelp forest still holds a special place of wonderment in my heart and I am happy to say I conquered my fear of the depths. Categories: Katauta, Nature, Photos, Poetry, Ramblings, Three Line Poetry | Tags: Photos, Pic and a Word Challenge, Poetry | Permalink. This is so cool. I love this. That’s so cool you went back to that very same spot in Carmel. I often have wanted to scuba but have never done it! You inspire me. Thank you. Aw, that’s great! I decided early on I had been a pirate sailor in a previous life. This is a beautiful, touching and inspirational story. Wonderfully done! And the poem is perfectly worded. Love the image too. Now I don’t know how I’ve possibly missed that place, given how many times I’ve driven up and down the coast in that area. Thank you for the support! Please, go and get certified. You will not be sorry. It adds another layer of experience to traveling at least when you are near the water. I really want to! Carmel is so pretty. I used to live around there. Not any more. Boo hoo. It is one of my favorite places on earth because you both can hike and dive. But it is small -nestled away. They only let 24 or so divers check in per day so you have to get up at four dark thirty and get in line for a highly coveted spot. Must be well worth the effort! Arrgh, I would cry too if I had lived there and had to leave. Enjoyable read. It’s great that you were able to go back and dive there. The photo of it is very inviting , yet on the mysterious side. Thank you. Yes, the place has a lot of character even when sunny. This day was foggy so the landscape had a dark muted quality to it. Ha! Yes, I am so glad you brought that up. I related to that quite fondly the first time I read it many moons ago (pre-movie). I thought about referencing Garp but wasn’t sure folks would get it. Silly me, bloggers are literary types, of course they’ll get it! Undertoad has permanently replaced undertow in my families vocabulary. Arrgh, I’m sure we plundered the seven seas together! Yes, I read it pre movie too. We used to visit the Gold Coast every year and the undertow was quite strong but we always swam between the flags to avoid rips. I’ve never been a good swimmer but I did enjoy the freedom that was given from the buoyancy of a wetsuit while snorkelling once; until I saw a shark. Photo, haiku, and autobiographical sketch — a great triptych. Point Lobos is indeed a magical place. Thank you! Yes, one of my favorites. Awesome poetry and prose. For me, growing up in San Diego, there were undertow, jellyfish, and barracudas, on the beach the dreaded land shark. Thank you! Yes, and the water was COLD!